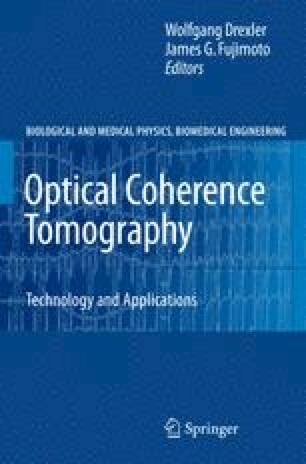 In all OCT-systems used in dermatology, the intrinsic interferometer required for the depth-resolution (A-scan) is realized in a mono-mode fiber technology (Fig. 35.1). For the so-called time domain OCT (TD-OCT) (Fig. 35.1a), different techniques of moving the reference arm are established. The optical length of the reference arm can be varied by moving mirror systems as well as by fibre stretching. For an optimal axial resolution, the A-scan is synchronized by moving the focus inside the tissue as realized in the SkinDex300 (Isis Optronics GmbH, Germany). Other systems measure without moving the probe focus relative to the tissue, which results in an easier instrumentation, a faster scanning rate, but compromises the lateral resolution. Since 2003, OCT device based on the so-called spectral domain OCT (SD-OCT) (Fig. 35.1b), in which the reference arm has a static position and the interference modulation, detected by a spectrometer, is used to generate the depth information of the A-scan (“Spectral Radar OCT”). The main advantages of this technique are an order of magnitude faster scanning rate and an up to 10dB higher contrast. On the other side, the SD-OCT is phase sensitive, which means that the depth information has to be recorded very fast in order not to destroy the interferometric signal.